Seen here is a partial skeleton of an animal that lived between 242 – 247.2 million years ago. The remarkably well-preserved fossil was discovered in the Guanling Formation located in ‬Guizhou Province, China. The fossil was identified as Barracudasauroides panxianensis, a genus of mixosaurid ichthyosaur which lived during the Middle Triassic. 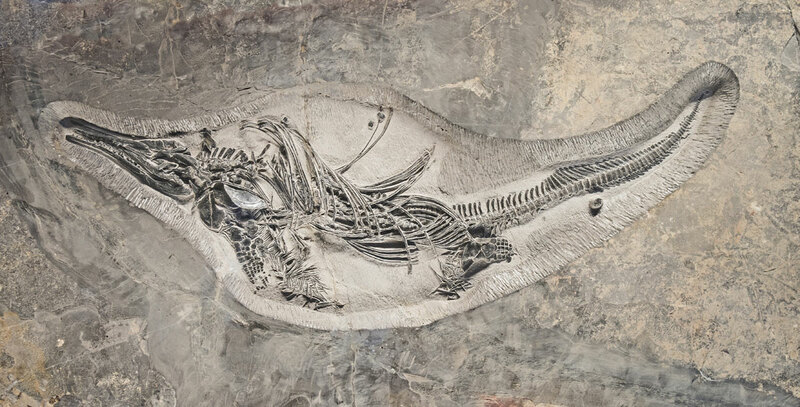 If you want to see the fossil in ever greater detail, check out the 5,240 x 2,667 pixel version.